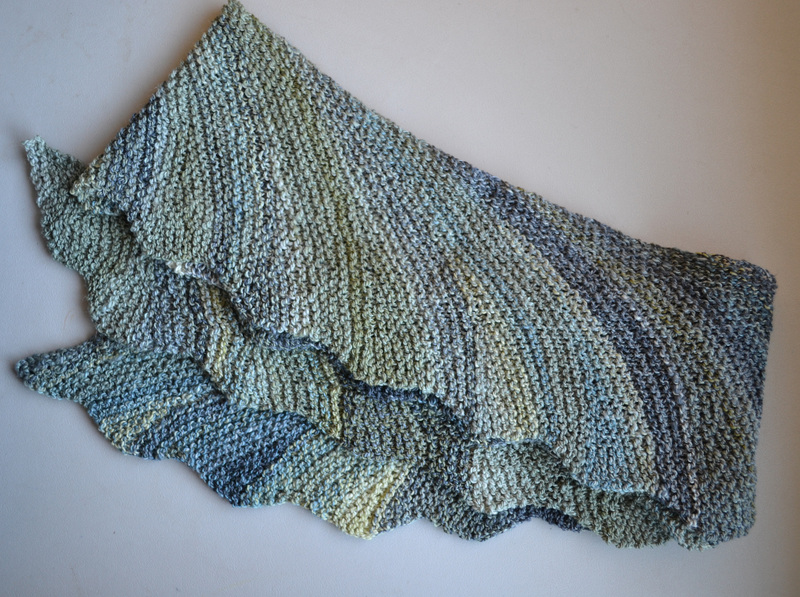 January and February brought a new knitalong + spinalong over in the Three Waters Farm Ravelry group. Featuring the prolific Susan Ashcroft’s designs, this was a super active event in the group (Ravelry tallies 80 projects and almost 200 photos shared!) and you’d better believe that an active Three Waters Farm thread is an inspiring one. My first spin of 2016 was created just with this event in mind. 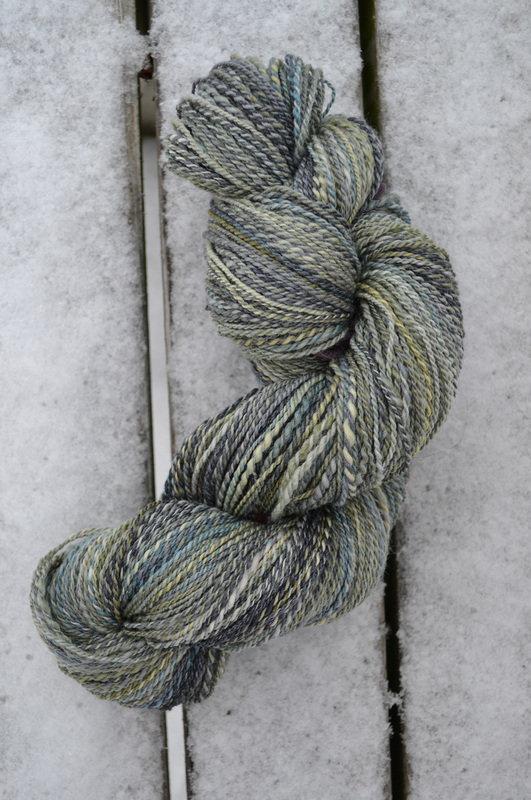 I knew I wanted this “Broken Pavement” Merino/Superwash Merino/Silk yarn to be a shawl and there are no shortage of options when it comes to Susan Ashcroft’s designs. Originally I thought I’d do a Quaker Yarn Stretcher, but when I cast on and started working the pattern it wasn’t right for the yarn. Don’t get me wrong, the pattern is fantastic and I’ll surely use it eventually, but it just wasn’t it for this yarn. I went back to searching. What I found was Samothrace Wings. It was a super quick scarf that I whipped up in a week and the only in-progress photo I have of it is not cooperating with my blog. I thought it would be more complicated, but I had it memorized in no time and likewise finished in almost no time. Honestly, the biggest delay I had with this project was waiting for my blocking mats to free up so I could wash & dry it. And then over the weekend I was finally able to get some photos. And I took a lot of photos because it’s just so pretty. I just love how subtle the colors are. 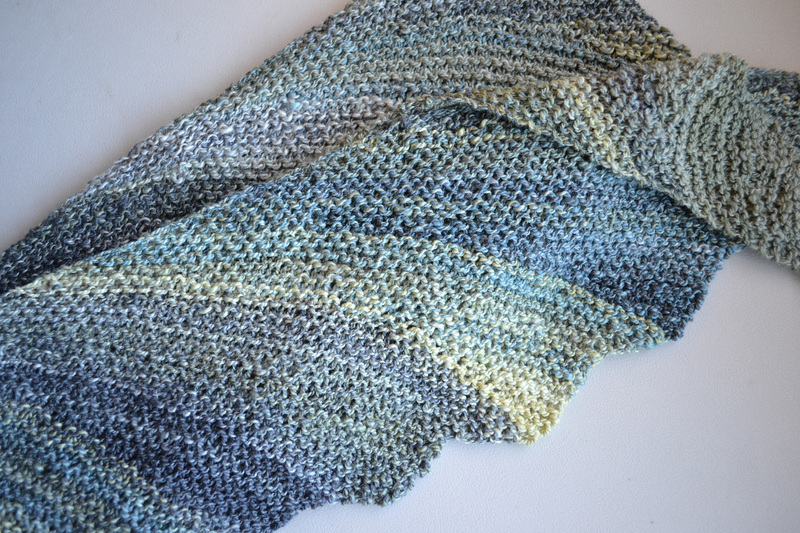 Many other versions of this pattern highlight the short-rows a lot more, but mine is more like lapping waves on the beach where the colors all kind of overlap and topple over each other (thank you, 2ply handspun!). I’ve really been on a kick with these long skinny scarves and shawlettes lately. Thanks to a skillfully written pattern I was able to use up just about every last bit of my 350yards of this yarn for this scarf, creating a really versatile length. I can wear it with the ends poking out like a scarf or tucked in, like this, so it looks almost cowl-like. Either way, I love that the length gives me options and that the subtle, almost neutral colors will surely go with almost everything in my wardrobe. 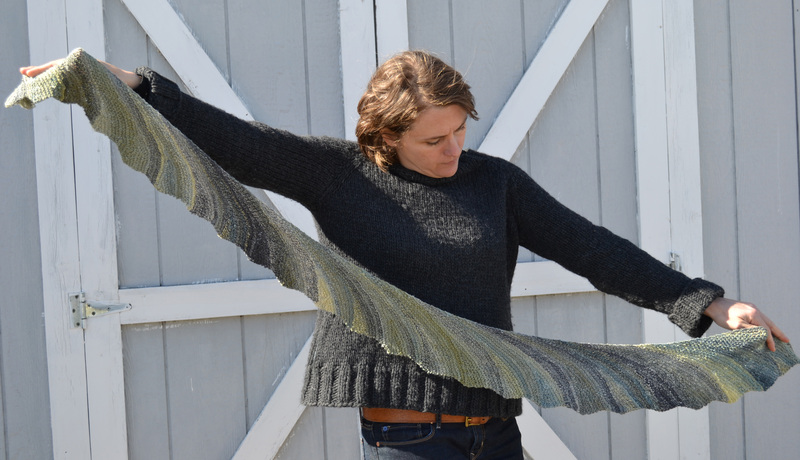 I was so happy with this pattern and so inspired by the group of spinners & knitters in this SAL + KAL that I actually knit up another of Susan Ashcroft’s patterns in another Three Waters Farm handspun. When you find a designer that you like, it doesn’t hurt to try a few designs, right?! I’ll share that soon, so stay tuned! LOVE the yarn AND the final piece. Great job. Thanks! I’m so happy with how it turned out and I really enjoyed the pattern — even more than I thought I would! 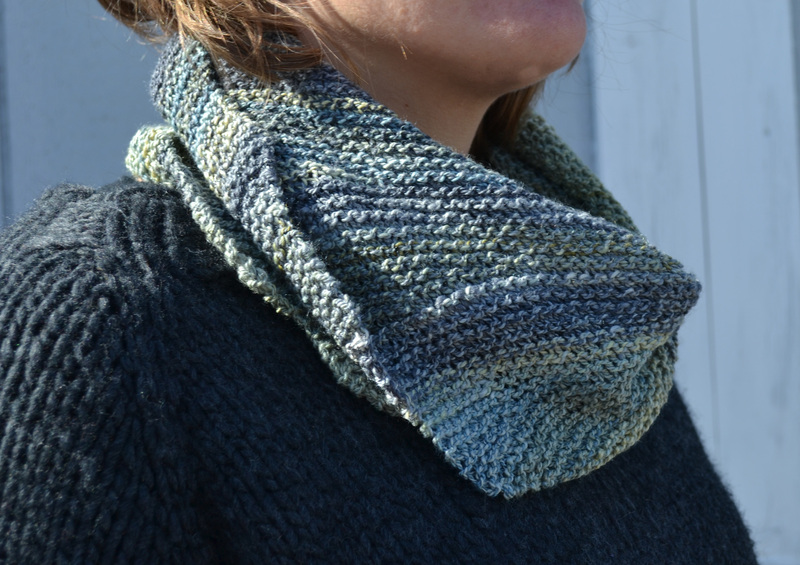 wow – perfect pattern for that beautiful yarn! You are right, it is very much like water. So that sweater you are wearing, Miss Skinny – is that the new one? It looks nice and roomy and comfortable. It is! I have that blog post all written and scheduled for it, too. It’s definitely a nice roomy fit — I kind of shrank a bit more than expected, but I still love it to pieces. Full story to come! 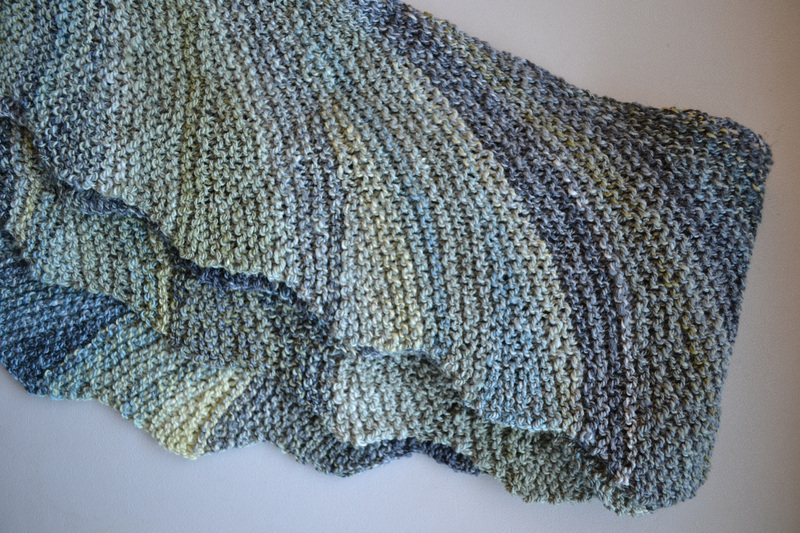 What a beautiful finished piece for your lovely yarn!